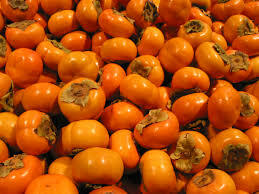 Persimmons are a sweet and crunchy autumn treat. These little fruits are loaded with antioxidants that can help keep you and your family healthy through the season. You can enjoy them as a raw snack, just slice and peel the skin off the fruit. Add them to your favorite winter salad, serve with goat cheese or try this pasta recipe that we found from The Little Epicurean (www.thelittleepicurean.com). The amazing persimmon from Small Creek Farm! Preheat oven to 350 degrees. In medium bowl, toss persimmon cubes with 1 Tbsp olive oil. Season with salt, pepper, and thyme. Toss to combine. Bake for 30 minutes until the fruit has softened slightly and can be easily pierced with a fork. Set aside to cool. Bring a large pot of water to boil. Add a little bit of salt. Cook the pasta according to the package instructions. We like ours al dente—not too soft and not too firm. Before draining water, reserve ½ cup of the pasta water for later use. In a large skillet, melt butter over medium heat. Once the butter is melted, add the onions and cook until almost translucent. Add half the arugula, then the other half. The timing allows the arugula volume to decrease slightly. Cook until the arugula begins to wilt. Remove the skillet from heat and add ¾ c. cheddar cheese and 3 Tbsp of the parmesan cheese. Add roasted persimmon and pasta and toss to combine. The cheese will melt and get sticky. Add the reserved pasta water to moisten pasta and create a cheesy sauce. Season with salt and pepper to taste. Serve immediately so the cheese retains its texture. If needed, reheat over stove. Serve with grated parmesan and the remaining cheddar cheese. You are ready to serve and enjoy! Garnish with the remaining cheddar and/or grated parmesan cheese. To make this gluten free, we use brown rice pasta. Let us know how you enjoy eating persimmons and share your recipe ideas with us at www.rogueproduce.com. That look like unique and healthy Pasta recipe. I will try it soon.